The business card is a stationery item so omnipresent that most people are unaware of its fascinating roots in European culture, or of its ongoing transformation. Today the exchange of one's card can be a purely professional act or a romantic overture, depending on the context. But in the 1600s, such distinctions were quite clear. In 17th century England, trade cards became a popular form of advertising. Without reliable street numbering systems or any widespread advertising forums, the trade card -- a small card bearing the business' name and a map -- was an essential means to spreading the word to potential clients. Meanwhile, in the courts of Louis XIV, visiting cards were in vogue. Eventually the practice of exchanging these cards became extremely nuanced, dictated by the strict social guidelines of the Victorian Era in both Europe and America. The turning of one corner, the placement just so in the calling card tray, or the number of cards left behind all had varying significance to the lady of the house, and was an essential ritual to establishing oneself in society. It was at this time that the calling card case was invented -- an accessory that to this day delights the fashionable stationery lover. In the twentieth century, the business card was ostensibly intended for professional exchange. But as we all know (whether from experience or, for those of us who came of business card age in the 21st century, from Hollywood), the line between business and calling card is blurry. How many leading ladies have you watched bite her lower lip while running a finger over the engraving of Mr. 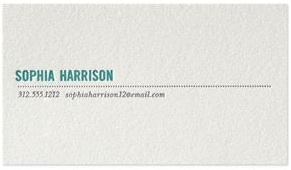 Right's business card, sighing at a silent phone? Today the business card continues to transform, along with a workforce that is far more varied and transient. 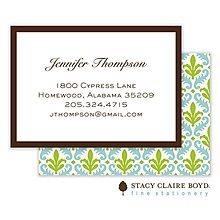 A modern calling card is often more about the individual than the business, especially as employment fluctuates often. It is increasingly common for one's card to include a personal website, and to incorporate more modern and eye-catching design elements -- a means of setting you apart from the rest, and making a lasting impression on your acquaintance. Even in today's virtual media saturated space, the business card is an indispensable marketing component for any serious business professional. In Japan it would be unheard of to make a business introduction without the presentation of a business card. And here in the U.S., it continues to be a integral part of the branding package and a stationery essential. 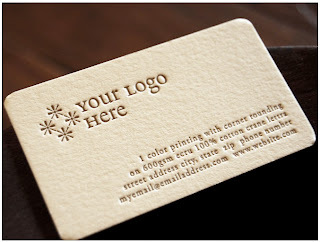 The business card reigns and is gaining, not losing relevance (professional or otherwise). An up-trending popular variation is the "mommy card". Whether you're a full-time mom or balance work and motherhood, the mommy card is intended as a more personal means of exchanging contact information. Typically a personal email address, cell phone number and home phone number are included, in order to make communication quick and direct. Often these cards bear a photo of your child or fun whimsical designs, thus differentiating it from (typically more reserved) business cards. Intended to be distributed among friends, family, teachers, parents of classmates and playmates, babysitters -- these versatile cards are quickly becoming an essential for the 21st century mom. Check out our range of quick and affordable business, calling, and "mommy" cards on our website here! Or stop by our shop to take a look at the beautiful paper options available for a more unique custom design -- we can incorporate your business' logo or custom art to achieve a look that is distinctly yours.